Queen Minnie's lady-in-waiting and Donald's sweetheart. Daisy caught Donald trying to tell Goofy a secret. Apparently not even she or the Queen could know about it, so she demanded an explanation. She becomes worried after hearing the King's letter, but Queen Minnie asks her to simply trust the King. Before going on their quest, Donald asks her to take care of something. She quickly assures him that she will and reminds Donald and Goofy to be careful as they leave for their journey. 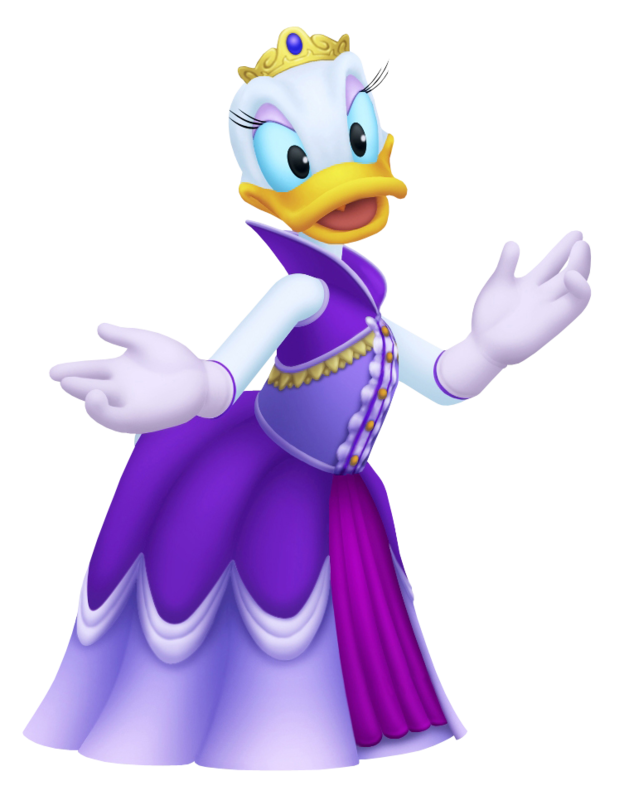 She appeared again at the end of the game with Queen Minnie just as Huey, Dewey, and Louie return to Disney Castle. Donald Duck's sweetheart, and one of Queen Minnie's ladies-in-waiting. As one of those left behind when the King, Donald and Goofy set off, she keeps the Queen company as well as helps her run the castle as the two prime figures around. Ever loving yet somewhat forceful, she is overjoyed to see Donald again when the party returns to the castle. When faced with the sudden repeating parting, she manages to put on a strong front, believing fully in her beloved and his friends. Lady-in-waiting to Queen Minnie and girlfriend to Donald Duck, she appears at the Million Dreams Award ceremony to applaud the recipients.